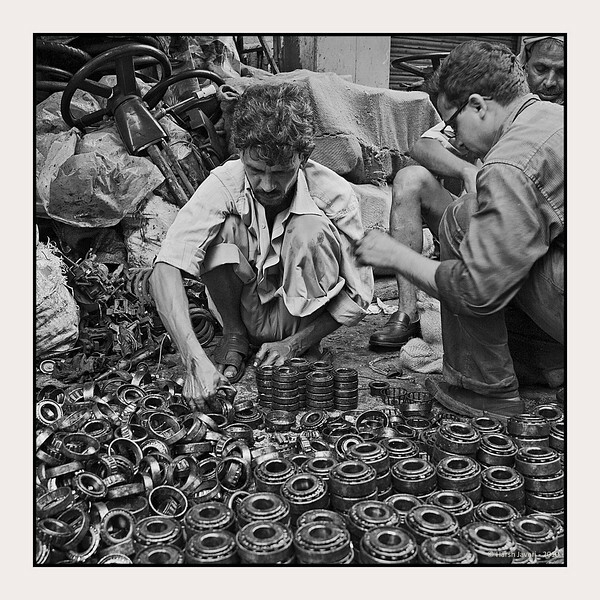 Chor Bazaar, located near Bhendi Bazaar in South Mumbai, is one of the largest flea markets in India. The word Chor means "thief" in Hindi-Urdu. The reason it is known as "thief's market", is because it assumed that goods sold there are stolen. There's a saying about this area, if you lose anything in Mumbai you can buy it back from the "chor bazaar"! Most of proper shops are closed on Friday as this area is in the heartland of one of the largest Muslim populations in Mumbai. Chor Bazar is a maze of streets with shops that look like musty attics and sell just about anything at bargain prices from old ship parts, grandfather clocks, gramophones, to crystal chandeliers and old English tea sets antiques at throwaway prices, including colonial-era lamps, Art Deco clocks and trinkets of every kind. It's not an easy job to shop here as one has to rummage through a lot of stuff, including junk and then set about bargaining. Lots to see in this one! Wow! This is a fantastic photo! Great job Hershy! Really a fantastic shot. One of my favorites of yours, I think. I love the way the round thingys channel your eye into the picture. So much of interest and such a terrific conversion. Love the tones and comp. Well done. Wow, this really is a work of art! You have been producing some fantastic street scenes, please keep them coming!